Camp Krem - Camping Unlimited | (831) 338-3210 | "Giving exceptional people the opportunity to be themselves - since 1957"
For more than half a century, we have provided children and adults with developmental disabilities a full program of recreation, education, fun and adventure. We offer Summer Camp and a Year-Round Respite Program. Our outdoor enrichment camp programs, activities and adventures are unmatched. We proudly work with people with all developmental disabilities. We have something nearly every weekend of the year! 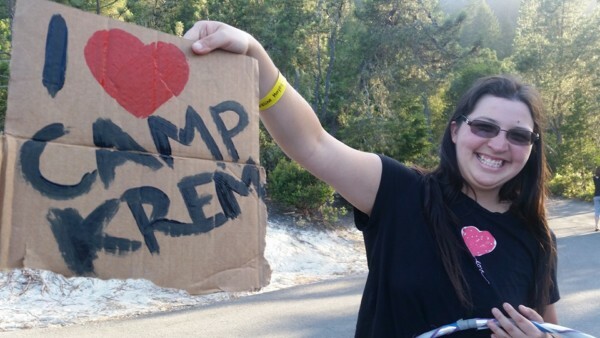 “Our daughter Sarah had another wonderful and exciting 10 days at Camp “I can’t tell you what it meant for me to be able to bring my daughter Sam to Camp Krem. Shem had so much fun! Everyone was fantastic and helpful when we arrived, and Sam was positively giddy when I picked her up. This was a real milestone for us, and it has given me huge relief. We will definitely be back next year!” – Lisa W.
“Julia has had wonderful experiences at Camp Krem and we see significant growth every time she returns.” – Stephen and Barbara W.
“Camping Unlimited was established in 1957 and is a 501(c)3 non-profit organization which provides fulfilling camping, recreational, educational and respite services to children and adults with developmental disabilities around the year. At Camp Krem, we nurture independence and self-confidence, encourage responsibility, develop a sense of worth and respect for others, and build lifelong relationships through a warm and friendly atmosphere of planned permissiveness.